The Venus GX is the communication-centre of your installation. Venus allows you to talk to all components in your system and ensure they are working in harmony. Monitoring of live data, and changing settings is performed by using your smartphone (or other device) via our free-to-use Victron Remote Management Portal (VRM). ​With Bluetooth built-in, the BMV Smart is ready for the Internet of Things (IoT) era. 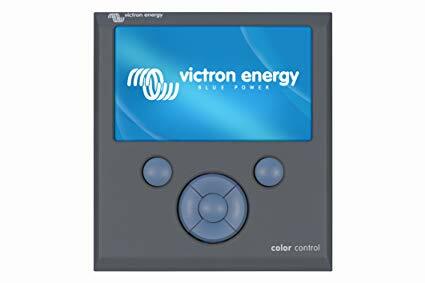 With Bluetooth being implemented in most other Victron Energy products, wireless communication between products will simplify system installation and enhance performance. The MPPT Control lets you see the status as well as setup all BlueSolar MPPT Charge Controllers that have a VE.Direct communications port. The new MPPT Control is mounted in the familiar BMV-700 series housing, maintaining a consistent and professional look to your panels and systems monitoring equipment. See the user and installation manual as well as our MPPT Control blog post for more information. The SmartSolar Control Display is a pluggable LCD display for the SmartSolar Charge Controllers. Simply remove the rubber seal that protects the plug on the front of the controller and plug-in the display. Using the VE.Direct to LoRaWAN module you can connect your BMV, MPPT or Phoenix Inverter to the Victron Remote Management portal. View information such as battery status or solar power wherever you are on your desktop or mobile phone. 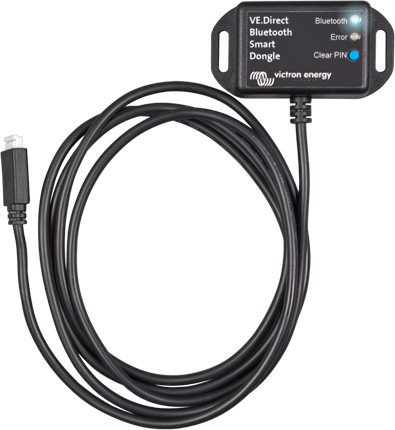 Using the VE.Direct to Bluetooth Smart dongle you can display your BMV or MPPT information on iOS and Android devices, using the VictronConnect app. View information wirelessly such as battery status and solar panel power, plus other useful data. The dongle is able to read data from all products with a VE.Direct port, such as the BMV-70x series battery monitors, Phoenix Inverters with VE.Direct port, MPPT Solar Charge Controllers. This panel is intended both for Multis and Quattros. It allows PowerControl and PowerAssist current limit setting for two AC sources: a generator and shore side current for example. Setting range: up to 200 Amps. The brightness of the LEDs is automatically reduced during night time. ​This panel is intended for Phoenix Inverters equipped with a UTP remote monitoring and control socket. It can also be used on a MultiPlus Inverter/Charger when an automatic transfer switch but no charger function is desired. The brightness of the LEDs is automatically reduced during night time. Only for models: 12/1200, 12/1600, 12/2000, 12/3000, 12/5000, 24/1200, 24/1600, 24/2000, 24/3000, 24/5000, 48/3000 and 48/5000. ​Remote Control Panel for 24V battery system Lynx Ion. ​A remote on-off switch for the Skylla-TG Charger. ​Remote Panel for BlueSolar PWM-Pro. The Blue Power Panel provides intuitive control for all devices connected to the VE.Net network. It can be used to view and configure the full range of settings on VE.Net devices. Furthermore, its fully customizable overview screens make it the ideal monitoring tool for your power system. The BPP now features an integrated VE.Net to VE.Bus Converter (VVC). This allows you to combine the powerful control of the VE Configure software with the simple interface of the BPP, without requiring a computer or additional interface devices.